In 1910, President Taft faced off against House of Representatives member James A. Tawney, who called into question the president’s travel fund and “injected the matter of Southern hospitality into the debate.” President Taft, so flustered by the intimation of wrong-doing regarding his travels and the suggestion that in the South, board was charged (to the president, nonetheless), responded to Tawney in an open-letter made public at the White House. From the beginning, Southern hospitality has revolved not only around history and etiquette, but almost every aspect of it has also included an association with some form of food – Southern food, of course. A quick review of the history of Palmetto Bluff shows that people have eaten well in the Lowcountry for a very long time. The earliest Native Americans, the Altamaha and Yemassee, found sustenance in the remarkable bounty of fish and game. Their shell middens on the high bluffs are testament to the first oyster roasts—a social and culinary tradition still carried on with great relish here today. Southern food, perhaps more than any other regional cuisine in America, has long been recognized for its diversity and history and for the stew pot of cultural influences that history has brought to it. Its primary influence has undoubtedly been African. From the early Colonial period, beginning with the rum and sugarcane plantations of the West Indies and the Creole French and Spanish inhabitants of the deep South, food was interpreted through African hands. They harvested the fields, cleaned the game, ground the spices and cooked the meals. They brought with them staples such as peanuts and okra and adapted immediately the Native American’s predilection to corn. Shortly after the turn of the twentieth century, R.T. Wilson, Jr. entertained lavishly in his magnificent “Palmetto Lodge.” The Palmetto Bluff estate was designed with guests in mind. Visitors arrived at the estate by way of a Savannah Line steamship, the Atlantic Coast Line Railroad, or the Seaboard Airline train. The social pages of the New York Times listed the comings and goings of the New York elite with frequent mention of individuals “leaving today to visit Mr. and Mrs. R.T. Wilson of Palmetto Bluff, S.C.” Guests would stay for weeks, enjoying Mrs. Wilson’s lavish parties. One can only imagine the elegance and bounty of the meals served there, with the freshest ingredients harvested from the surrounding waters and woods and the produce of Wilson’s extensive farms. In the 1950s, Union Camp Paper Company built a rustic but charming hunting lodge overlooking the May River. In the long, wood-paneled “Trophy Room” sumptuous game dinners and feasts of local seafood were presented nightly. Prepared by lifelong Lowcountry cooks, an evening’s meal might include quail, venison, boar, shrimp, crabs and oysters—all harvested on the property or from the adjacent waterways. As many as 28 guests would visit the 14-bedroom lodge at one time. 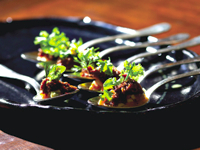 In the modern South, such formality has given way to a more casual approach to food. But the food is always there. And it is front and center at Palmetto Bluff. From afternoons spent “porching” and sipping sweet tea (or something stronger) to crab cake socials that spill from the sidewalks to the Village streets, to oyster roasts where guests stand elbow-to-elbow at a common table partaking in the sweet bounty of the river and the enduring camaraderie that the tradition creates. Food is paramount. And, the greatest testament to the ever-evolving food traditions at Palmetto Bluff is Music to Your Mouth. 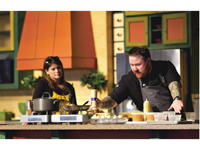 Bravo TV’s Gaill Simmons watches as former Top “Cheftestant” Kevin Gillespie, of Woodfire Grill in Atlanta, puts the finishing touches on his to die for deviled eggs. Simmons hosts the Saturday Culinary Festival, this year on November 19. What began as a weekend shindig five years ago has morphed into a year-long food and wine series that culminates in a week-long celebration of Southern food and culture at the Music to Your Mouth Festival. Come November, Palmetto Bluff will host 16 events over the course of seven days, each aimed at putting your taste buds in overdrive. With dueling sommeliers, a bourbon-infused boat cruise, a chef showdown where things are sure to get hot in the kitchen, a Potlikker-themed Block Party, a golf outing and PIGnic, and the “Hair of the Dog” 5K road race, the event schedule offers something for everyone. To ensure that no detail is overlooked, the Music to Your Mouth team taste-tests their way around the South nine months out of the year. They pour over the James Beard Award nominee list and subscribe to every foodie e-newsletter in cyberspace, seeking out the South’s biggest and brightest stars in the food world. Then, they gather the most distinguished vintners and brewers from the United States (and beyond). 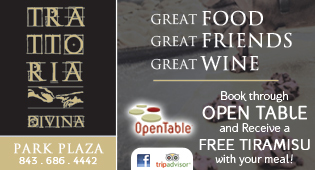 Finally, they pair it all with a diverse array of local farmers and artisans. The result? 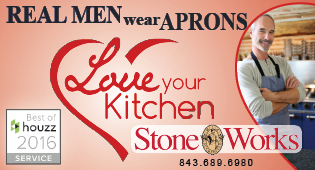 The perfect plate of Southern cuisine, good music, and informative, energetic celebrity cooking demonstrations. A spoonful of southern soul food from sibling chefs Kenny and Kirk Gilbert. Palmetto Bluff’s food and beverage director Jeremy Walton says, “Perhaps the biggest complement (and compliment) to the event this year, is the partnership with the Southern Foodways Alliance.” The Southern Foodways Alliance (SFA) stages events, produces documentary films, publishes compendiums of great writing, and—perhaps most important—documents and maps our region’s culinary standard bearers through oral history interviews. The SFA celebrates the diverse food cultures of the changing American South, recognizing the unsung heroes: fried chicken cooks, barbecue pit masters, bartenders, ham curers, and row crop farmers, showcasing unique talents, telling honest and sometimes difficult stories of the region, and inspiring communities to invest in their culinary cultures. The SFA is ahead of the curve in that fact that they follow no status quo. They are off-beat and quirky and have fun with their work. (They once constructed a bacon tree, draped with slices of cured pork belly.) The Palmetto Bluff team loves that about them. In November, Palmetto Bluff and SFA will come together to honor the culinary traditions of the past, embrace the present, and attempt to make a mark on the future. Guests and members of the media will join SFA Director John T. Edge for a screening of two Potlikker short films and a “juicy” discussion among chefs, growers, and television personalities, tackling topics such as cooking philosophies and trends, the media impact on the profession, and building community through food. 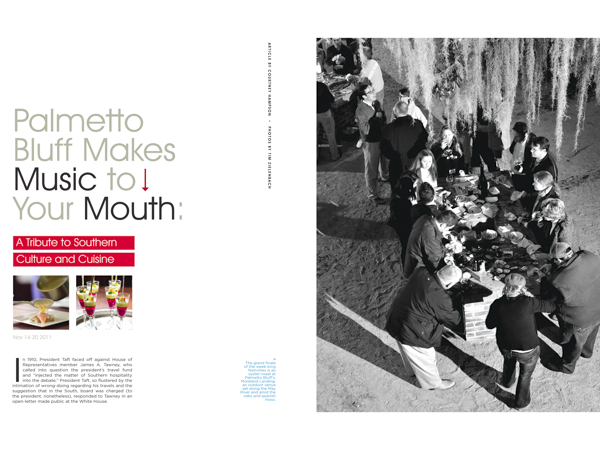 In the last 2 years, Palmetto Bluff and the Music to Your Mouth events have contributed more than $20,000 to Second Helpings, helping to feed more than 500,00 local restaurants from Beaufort, Jasper and Hampton counties in southeastern South Carolina. 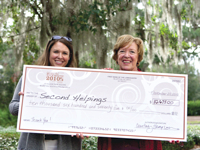 In the last two years, Palmetto Bluff and the Music to Your Mouth events have contributed more than $20,000 to Second Helpings, helping to feed more than 500,000 local residents from Beaufort, Jasper and Hampton counties in southeastern South Carolina. Since 1992, Second Helpings has “rescued” more than five million pounds of food destined for landfills and given it to agencies that feed the disadvantaged in Beaufort, Jasper and Hampton Counties. More than 160 volunteers from Hilton Head Island, Bluffton, Sun City and Beaufort gather perishable goods daily from local restaurants, caterers, resorts and grocery stores and deliver the food to approximately 65 local non-profit agencies. Twenty-five dollars of every Culinary Festival ticket, and $50 of each Whole Hog Weekend ticket package goes directly to Second Helpings. So, in a way, and in the true spirit of Southern hospitality, every person involved in the event will be giving back as they celebrate the local culture. I think we can all tip our glass to that. Experience an afternoon of golf at the award-winning May River Golf Club. The course, laced through centuries-old oaks and along the May River, will take your breath away. But, it’s Music to Your Mouth week, so it’s pretty important that you remember the food too! To fix that, celebrated BBQ Master Frankie Denmark of Hawg Wild BBQ will be spearheading the post-round pig roast effort. Two sommeliers—one northern and one southern—will struggle to pair the perfect pour with the plates of a northern and southern chef team. In the glass, Clint Sloan, sommelier at Charleston’s HUSK and McCrady’s challenges Jason Carlen, wine director at Spiaggia in Chicago, in this four-course paired battle for bragging rights. Cruise the coastline of Palmetto Bluff and Bluffton aboard the antique yacht Grace while sipping the sauce and savoring some southern delights. See, swirl, sniff, sip, and savor the wines of Nickel & Nickel. You’ll experience the full sensory examination and evaluation of wine. Cheers! Can they stand the heat? Chef Chris Hastings of Hot and Hot Fish Club in Birmingham, and Chef Mike Lata of Charleston’s FIG will battle plate for plate, palate for palate, course for course, and you will be the judge of who has overpowered, underwhelmed or achieved pairing success on your plate. Armed with the same wines and food budget, these two kitchen connoisseurs will create their own menus to match the wine selections of Chateau de Beaucastel. Four wines. Eight plates. You decide. Join celebrated Southern chef Sean Brock, who will talk about food of place and teach you how to master the kitchen as well as some iconic Southern dishes that will leave the guests of your next dinner party drooling. 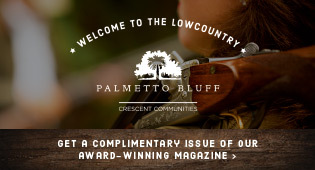 A friendly competition set amid Palmetto Bluff’s spectacular neighborhoods and nature trails. Racers will receive a race T-shirt and be greeted with a Blood Mary and fanfare when crossing the finish line. A gathering of culinarians, winemakers, growers, and artisans, brought together to accentuate the abundance of ingredients from our surrounding waters, woods and local farms. They showcase their finest nibbles and nectars and take our guests on a sensory experience that can only be called Music to Your Mouth. Bravo TV’s Top Chef personality Gail Simmons will host the festivities. Hungry for more? Go full boar with the Whole Hog Weekend Package, which includes entry to private events only offered to the Whole Hog guests. 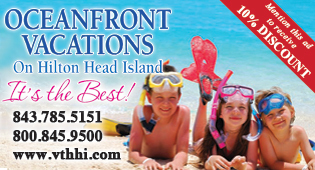 For more information and tickets visit www.musictoyourmouth.com.